In 1439 the forces of khan Ulu-Makhmet attacked the Trinity monastery which was founded by venerable Makary nearby the Zheltovodskoe Lake. The monastery was burnt, brotherhood perished from barbarians’ swords, and 90-years old elderly monk Makary was taken prisoner. Ulu-Makhmet, the khan of Kazan, paid particular attention to the comely hegumen. Those who brought the captive told: “This is a meek man; neither his word, nor a deed has caused evil to his or even to our people”. After that the khan cried with anger to his military leaders: “Why did you offend such a good man who hasn’t argued with you; why did you ruin his dwelling? Or don’t you know that God, Who is the One above everybody and everything, can become angry for such gentle people?” After these words Ulu-Makhmet ordered to set innocent martyr free. Gotten freedom venerable Makary asked to release other captives, too. So, 40 men and some women with children escaped their fetters. Returning home, wayfarers stopped on the right bank of the Svijaga river mouth. Saint Makary chose this place not only to have a three-day rest, but also to found a monastery there. This area is situated at a height; from three sides it is protected from winds by a hill, like a high earthen rampart. Sources of spring water in abundance irrigate the ground that was blessed by prayers of venerable father. But the khan of Kazan prohibited them to stay in his territory; therefore wanderers had to find another refuge.At last they have reached Galich land and stayed in the town of Unzha. Residents of Unzha received venerable Makary with a great joy; they surrounded him with esteem and concern. But, looking first of all for the realm of God (Mathew, 6, 33), the great devotee left the town. In 15 versts (about 15.9 km) from the town on a raised deserted place on the right bank of the river Unzha saint Makary built his cell. Again people, longing for monastic life, began gathering around loveful father. Soon the monastery was arranged, but just for a short time monks could enjoy wise speeches and life of the saint elderly monk. After Kazan was captured by czar Ivan IV, its environs were lit up by the light of Christ. The time to fulfill the will of the saint has come. In the first part of the 17th century a schema monk Isaiah arrived from Unzha monastery at the steep bank of Svijaga’s mouth. By that time venerable Makary had been canonized. His icon which had been brought by Unzha monk, became a gonfalon, under which the forces of Christ began to gather. Schema monk Isaiah prayed with awe, because he knew that prayer was the basis of the monastery. Inhabitants of neighboring villages treated the saint monk with particular love and respect; and when the kind hermit passed away to God, they put a gilt tomb above his grave. In one of the divine service books from the library of Makary monastery the following note was made: ”In 7169 (1661), on December, 10, schema monk Isaiah, the recluse of Makary monastery on Svijaga river, passed away”. The first church in the monastery was built in honor of Ascension, because precisely at that great holiday venerable Makary had been set free. At first the church was wooden, and in 1691 it was replaced by the one made of stone. A sacred corporal from Ascension church, which had been signed by metropolitan of Kazan and Svijazhsk Tihon III in 1703, was kept in a vestry of Makary monastery. An aisle in a refectorial part of this church was created in honor of venerable Makary Zheltovodsky. According to the register of monasteries in Kazan eparchy, dating on 1739, one more church existed in the monastery. It was devoted to saints Joachim and Anna and was situated on the gates. 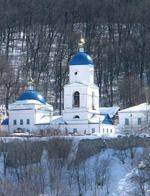 In 1693 Arseny, the Bishop of Andrussy, was sent to Makary monastery to serve a penance. He has been excommunicated by the Holiest Patriarch of Jerusalim Dosifei II for something happened. The rest of his life bishop Arseniy lived in penitence, and went to God on 14th of April, 1706. He was berried in Transfiguration monastery that was situated in the Kazan Kremlin. By the request of metropolitan Tichon III the dead bishop was absolved from penance. A certificate of absolution with signatures of Konstantinopol Patriarch and also of eleven archbishops was put to coffin and its translation from Greek was sent to the vestry of Kazan metropolitan. In 1764 a decree of secularization of church estates was issued. Makary hermitage wasn’t declared to be neither state, nor nonstate monastery. It was attached to Sviazhsk Assumption monastery, and Sviyazhsk priests served in Makary monastery in turn, because it was the place where monks and nuns from men and women Sviyazhsk monasteries were being berried. There is a cemetery for the residents of Sviazhsk town near the hermitage. The beginning of the cemetery is related to the 16th century. Most Reverend Father Amvrosy, the archbishop of Kazan and Sviyazhsk, in 1796 began to ask the Holy Synod about adding Makary hermitage to the number of seven monasteries of Kazan eparchy which were in his own upkeep. The matter was being delayed. 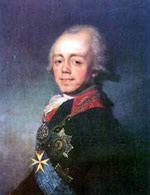 But in 1798 emperor Pavel Petrovich made a tour by Volga. He was admired with a beautiful scene of Makary monastery and indicated a wish of its restoration. The request of archbishop Amvrosy was established, Makary heritage became independent, 300 roubles were assigned for its upkeep and 270 acres of plowing soil were given for the ownership. The resumed monastery was put in ordeals. In 1800 all cells were burnt. These were envious neighbors, who didn’t like to observe a hermitage, provided by monarch’s generosity, and so they tried to take away its property. Monks have lost an opportunity to make use of their land and fishing for more than 11 years. Cattle were sold, and a hut from the cattle-yard was moved to the hermitage to arrange cells there. But fire element destroyed them once again in 1829. But God sent a consolation to suffering monks. 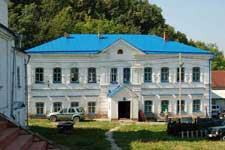 Court process ended in favor of Makary monastery. Money, recovered from greedy people, was used for constructing a two-stored building in 1830. The first floor was made stony and the second – wooden. There cells, kitchen and refectory were arranged. At first priors in Makary monastery were builders, then, according to the decree of metropolitan Tichon III, hegumens, and after the reconstruction of the monastery again builders. According to a degree of Holy Synod of 1798, 1 builder, 2 monk-priests, 1 monk-deacon, 1 monk and 2 novices were determined to stay in Makary monastery. Services stopped in the Ascension church. In time the church has become unsafe. According to the blessing of Most Reverend Father Filaret, the archbishop of Kazan and Sviyazhsk, monk-priest Anatoliy began restoring the church. Significant donations to this affair were made by Savrasov N.I. and Kazan landowner Lebedev E.A. Three altars were arranged in the church: one of them in honor of the Ascension of Our Lord Jesus Christ on the second cold floor, and others in honor of the icon of Our Lady “Joy” (“Consolation”) and in the name of venerable Makary on the first warm floor. Then the belfry was erected. The renewed church was consecrated in 1839. After managing the Kazan eparchy Archbishop Vladimir had got a wish to settle in Makary monastery, and that’s why in 1847 a two-stored house was built according to the archbishop’s plan and under his observation. Funds were allocated from the archbishop’s house. 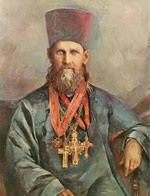 Monk-priest Vitaliy became the chief of building works (he was a former administrator of the archbishop’s house). That was not the end point of worrying about prosperity of the hermitage. In 1866 a new church was consecrated. Stony and warm it joined three altars. The main altar was sanctified in honor of the icon of Our Lady “The Joy of all grieving”, on the right side – in the name of saint Afanasy the Great, the archbishop of Alexandria, and on the left – in honor of all saints. Builder monk-priest Martinian (Muratovsky) began erecting this church, but in 1861 he was moved to Irkutsk Ascension monastery. So then monk-priest Alexander ended the building. Also a two-stored block was constructed at this church. The first floor was fitted as brothers’ cells, and Father Superior arranged on the second floor. Two ancient icons were donated by landowner Likhacheva to the new church in the year of its consecration. They were the icon of Christ not made by hands and the icon of Our Lady “Tolgskaya”, which were decorated with gilt silver overlays. These icons were arranged on pillars. In 1887 the icons of twelve feasts of the Christian year were painted on the arches of this church. Altogether 36 sacred paintings were made in the church, and an oven was created for its heating. The icons in Ascension church were made of the ancient style. Particular esteem was given to two of them. 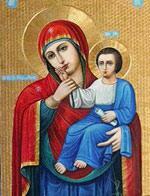 The first one is the icon of venerable Makary, which has been brought by schema-monk Isaiya. It has been covered under the silver overlay. The second one is the icon of Our Lady of Vatoped “Joy (Consolation)”, which has been brought from the saint mountain Mount Athos. Its silver overlay has been decorated with pearls and stones. In the middle of the 19th century a large icon of saint martyr Panteleimon with a fragment of his relics was sent as a gift to Makary monastery from Mount Athos. There wasn’t a similar sacred thing anywhere in Kazan eparchy, so a great number of devotees gathered in front of it, asking Holy doctor about their health. Father Superior hegumen Dimitriy didn’t forget about pilgrims. In 1888 he built a house with attic for pilgrims. A wooden house, covered with iron, was supplied with everything necessary. In a year a stony two-stored building was built instead of two houses. It was possible to arrange there 12 brothers’ cells and also a kitchen with a refectory. 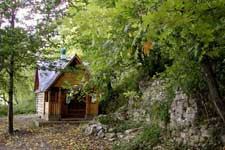 In 1892 a wooden chapel was built over the source of spring water. Due to the statute, on special days religious processions made their way there and priests hallowed the water. 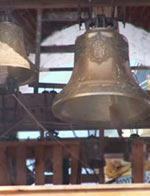 A bell of 210 poods (3360 kg) became the decoration of the belfry in the monastery. It was bought in 1894 either on means of the monastery and also thanks to charitable contributions. In the end of the 19th century plowing land, wood and torment mill were given from the state to the ownership of the monastery. Also the hermitage bought wood, plowing and meadow land on its own funds. At the same time the 111 meters long stony wall was built around the monastery, because there was a necessity to defend it from landslides. On Sunday, 7th of July, 1902, saint righteous Joann Krondshtadsky visited Makary monastery. Here he serviced a Divine liturgy and delivered a sermon. People from Sviyazhsk and villages found out about his visit and filled up the church towards the end of the liturgy. After communal meal Father Joann sent his blessing to brothers and devotees and then set off further down Sviyaga and Volga rivers. 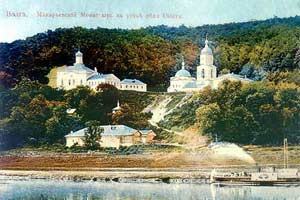 37 people lived in Makary monastery in 1904. They were monk-priest Antony (Chugunov), who carried out the duties of Father Superior, other 6 monk-priests, 3 monk-deacons, 7 monks and 20 novices. The overthrow of the tsar and his murder were a consequence of the digression of Russian people from God. 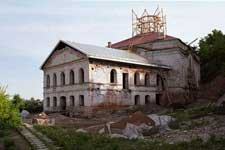 After the revolution orthodox monasteries were subjected to robbery, defilation and destruction. New people were not in need neither of God, nor of conscience. On September, 1918, Red-Army soldiers robbed Makary hermitage. In the soviet period (1936 - 1986) a sanatorium for children who had a tuberculosis was arranged in the buildings of the monastery. During the Great Patriotic War an army hospital was placed here. Towards the end of the 20th century the remains of Makary monastery were returned to the Church. The walls were preserved. Frames from windows, floors and roofs were destroyed by the fire in 1989 or were taken away by enterprising people. On the 1st of May, 1996, monk-priest Filaret (Egorov) was appointed to be a Father Superior of Makary monastery. In the same year service in the ancient church of Ascension was resumed. In 2000 archmandrite Sergiy (Zaitsev), archmandrite Alexander (Urodov) and monk Leontiy (Karyagin) were numbered among the assembly of new martyrs of Russia. All of them lived in Makary monastery in the beginning of the 20th century. Thanks to advocating of heavenly protectors, to prayers and work of hegumen Gleb with brotherhood, to charitable assistance of builders and pilgrims, the desecrated sacred place is being revived. In 2001 by the efforts of L.V. 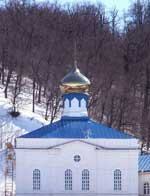 Anisimov a wooden chapel in honor of venerable Makary was built near the mountain under the monastery. In 2003 on the means of A.G. Pilishkin and the firm “Lit art” 10 bells were casted in Voronezh. Now every day a new belfry calls monks and pious pilgrims to prayer. A wonderful view of Makary monastery reminds earthly wanderers looking at it about an imperishable beauty of the heavenly town. In spite of the cramped doors and narrow way that lead to life, not only in ancient times but in the 21st century there are people who desire to devote all there time and all forces of their soul and body to become pious. God help them with His grace to go the way of redemption by the prayers of our venerable father Makary, the Zheltovodsky, Unzha and Sviyazhsk miracle-worker.